The H-1B programme allows high-skilled foreign nationals to temporarily work in the US. This column explores how changes in H-1B policy affect the quantity and characteristics of workers entering the country through the programme. The results suggest that reductions in the cap on H-1B workers have particularly hindered the employment of the highest ability foreign-born workers and have not led firms to hire more Americans. Sunday 1 April marks the beginning of an important H-1B application season. The H-1B programme allows high-skilled foreign nationals to temporarily work in the US. It is reserved for workers in specialty occupations requiring “(A) theoretical and practical application of a body of highly specialized knowledge; and (B) attainment of a bachelor’s or higher degree in the specific specialty (or its equivalent) as a minimum for entry.”1 The number of new H-1B issuances for employees of most firms is currently capped at 85,000 per fiscal year. The US fiscal year begins on 1 October, and the government accepts applications six months prior to the start of the fiscal year. Cap-bound H-1B applications exceeded the quota for H-1Bs during the first week of eligibility (i.e. the first week of April) in fiscal years 2008, 2009, and every year since 2014. The US allocated all cap-bound H-1Bs using a lottery in those years. The H-1B cap has varied across years, peaking at 195,000 in 2001, 2002, and 2003. Economists have exploited such policy-driven variation in the H-1B quota to better understand how inflows of highly-skilled foreign-born labour affect American workers and productivity. On the one hand, Doran et al. (2014) use evidence from H-1B pilot lotteries to argue that H-1B workers do not increase US firm productivity or innovation. On the other hand, several papers by William Kerr and co-authors (e.g. Kerr and Lincoln 2010) argue that H-1B workers improve US innovation and productivity. Ghosh et al. (2016) provide supporting evidence. Peri et al. (2015) argue that H-1B-driven increases in the science, technology, engineering, and mathematics (STEM) workforce have raised both US productivity and wages paid to US-born workers. Few papers examine how changes in H-1B policy affect the characteristics of foreign-born individuals entering the US.2 This issue is important because while the goal of the H-1B quota is to restrict the inflow of foreign labour, there are likely to be unintended effects on the average characteristics, ability, or quality of H-1B workers that could alter US productivity and wages as well. 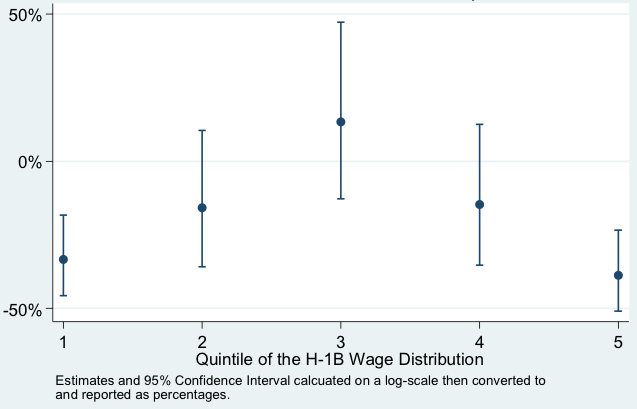 In a recent paper, we explore how changes in H-1B policy affect the quantity and characteristics of H-1B workers (Mayda et al. 2017). The economic intuition is simple. Firms across the globe compete to hire highly skilled workers. The strict quota and the lottery allocation generate uncertainty in acquiring the legal right to work in the US even after securing a job offer. Hence, talented foreign nationals might elect to work elsewhere. Similarly, US firms face uncertainty over whether they will be allowed to employ the top job candidates they have identified. Some firms might elect to forgo this uncertainty altogether by turning to alternative labour sources. Thus, even if an H-1B policy change statutorily applies to all foreign workers and domestic firms indiscriminately, it might affect them heterogeneously. We examine this issue using three sources of data variation. First, the 195,000 H-1B cap in place from 2001-2003 was never reached, so the pre-2004 period can be considered as de facto unconstrained by the quota. It was only after H-1B caps were reduced beginning in 2004 that H-1B restrictions would have had any impact. Second, caps only apply to new H-1B issuances. Established H-1B workers seeking to renew their legal work status or change employers were exempt. Third, employees of colleges, universities, and non-profit research institutions were similarly exempt from H-1B limits. These exempt groups provide a useful comparison for understanding a counter-factual world. Namely, they can give us a sense of what new H-1B workers at ‘for-profit’ firms would look like today if the US had not restricted their inflows beginning in 2004. We begin by assessing issues of quantity. We find that H-1B employment declined 20-50% relative to what would have occurred if firm demand – rather than a legislative limit – determined hiring outcomes. This is presumably the sort of direct effect that immigration opponents envision when advocating policies that restrict foreign-born labour flows. It is also the type of effect that economists like using to understand how exogenous changes in the number of immigrants, ceteris paribus, affect the aggregate economy or native-born labour outcomes. We also find that the reduced pool of H1-B workers available to for-profit firms did not lead firms to hire more Americans as there was no comparable response in the employment of native workers after 2004 in for-profit firms. We then assess a set of questions pertaining to issues of quality, ability, or general characteristics of H-1B workers. A priori, these are less obvious and presumably less intended policy consequences. First, we examine H-1B quality. To do so, we divide workers into quintiles of the H-1B wage distribution from the pre-2004 period when firms were effectively unconstrained by H-1B caps due to the high limits. If one accepts that wages are at least an approximation of workers’ marginal productivity, then it is reasonable to assume that higher-quality workers are in higher wage quintiles. We then ask how restrictions affected the flow of new H-1B workers at each quintile. Interestingly, we find no evidence that policy has reduced the inflow of new H-1B workers at for-profit firms from the middle of the wage distribution. Instead, declines are concentrated at the ends of the wage distribution. This is most troubling at the high-end: it implies that H-1B restrictions have particularly hindered the employment of the highest ability foreign-born workers. Anyone who believes immigration policy should be designed to attract ‘the best and brightest’ workers to the country should be troubled by the discovery that restrictions to aggregate inflows generate the opposite effect. Quantitatively, the number of new H-1B workers from the highest wage quintile is nearly 50% lower than it would have been in the absence of H-1B restrictions, but the number of new H-1B workers in the median wage quintile is unchanged. H-1B policy might affect other characteristics of H-1B workers (and the firms hiring them) aside from ability. For example, it is well-known that the majority of cap-bound H-1Bs are awarded to Indian-born individuals and workers in computer-related occupations. Some critics argue that the H-1B programme is a vehicle for outsourcing American jobs. Hira (2015), for example, claims that “Outsourcing firms received more than half of the H-1B visas issued in [Fiscal Year 2013].” Our data can help inform this debate by allowing us to analyse how H-1B restrictions have altered the composition of H-1B workers and employers. We find that the H-1B cap reduction may have been partly responsible for increasing the proportion of H-1Bs awarded to Indian-born workers, but only by 2-4 percentage points. The share of H-1Bs awarded to computer-related firms, in contrast, rose a significant 5-10 percentage points. We also find that H-1Bs are increasingly concentrated among a smaller number of firms. In particular, the proportion of H-1Bs awarded to employees of firms that hired 50 or more total H-1B workers in a given year has increased in response to the reduced cap in total H-1B issuances. It is possible that when faced with the uncertainty and costs of the H-1B hiring process, economies of scale and network externalities arise that favour firms specialising in H-1B employment and workers with specialised knowledge about the legal hiring process. In sum, we presume that by reducing the H-1B cap from 195,000 in 2001-2003 to 85,000 today, policymakers intended to reduce new H-1B employment at for-profit firms and possibly increase employment of competing US-born workers. The policy achieved the first but not the second goal. Moreover, the cap restriction also generated consequences that were likely unintended. The policy change has particularly deterred workers with the highest earnings potential from entering the US labour market. Given the potential for productivity-enhancing technological gains generated by H-1B workers, this loss could reverberate throughout the economy. Other important effects are distributional and favour computer-related occupations and firms that use the H-1B programme heavily. Amuedo-Dorantes, C and D Furtado (2016), “Settling for Academia? H-1B permits and the career choices of international students in the United States.” IZA Discussion Paper No. 10166. Doran, K, A Gelber, and A Isen (2014), “The Effects of High-skilled Immigration Policy on Firms: Evidence from H-1B visa lotteries.” NBER Working Paper No. w20668. Ghosh, A, A M Mayda, and F Ortega (2016), “The Impact of Skilled Migration on Firm-level Productivity: An investigation of publicly traded US firms.” IZA Discussion Paper No. 8684. Hira, R (2015), “Immigration Reforms Needed to Protect Skilled American Workers.” Congressional Testimony, 17 March 17. Kato, T, and C Sparber (2013), “Quotas and Quality: The effect of H-1B visa restrictions on the pool of prospective undergraduate students from abroad.” Review of Economics and Statistics 95.1: 109-126. Kerr, W and W F Lincoln (2010), “The Supply Side of Innovation: H-1B visa reforms and US ethnic invention.” Journal of Labor Economics 28(3): 473-508. Mayda, A M, F Ortega, G Peri, K Shih, and C Sparber (2017), “The Effect of the H-1B Quota on Employment and Selection of Foreign-Born Labor.” NBER Working Paper No. w23902. Peri, G, K Shih and C Sparber (2015), “STEM Workers, H-1B Visas and Productivity in US Cities.” Journal of Labor Economics 33(S1 Part 2): S225-S255. Shih, K (2016), “Labor Market Openness, H-1B Visa Policy, and the Scale of International Student Enrollment in the United States.” Economic Inquiry 54(1): 121-138. United States Code (2018), “Admissions of Nonimmigrants.” 8 U.S.C. § 1184(i)(1). See United States Code (2018), Title 8, Chapter 12, Subchapter II, Part II, Section 1184(i)(1). See Amuedo-Dorantes and Furtado (2016), Shih (2016), and Kato and Sparber (2013) for examples of how H-1B policy affects the education decisions of foreign individuals interested in studying in the US.